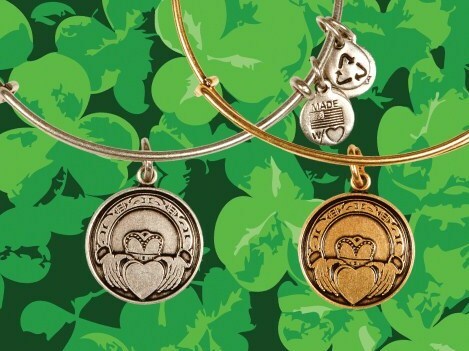 I’m loving these brand new Alex and Ani Claddagh charms (full disclosure: I’m as Irish as they come…). Symbolizing love (the heart), loyalty (the crown), and friendship (the hands), the Claddagh dates as far back as the 17th century and is given as a token of friendship or love. This Claddagh expandable wire bangle is available in a Russian Gold and a Russian Silver finish and retails for $28. The Alex and Ani Newport store is located One Bowen’s Wharf, (401) 849-3002. For other locations, click here. Entry filed under: Uncategorized. Tags: Alex and Ani bangles, Alex and Ani Claddagh bangles, Alex and Ani Claddagh charm, Alex and Ani Newport RI, Alex and Ani Rhode Island, Alex and Ani stores, newport ri jewelry, newport ri shopping, St. Patrick's Day Alex and Ani, St. Patrick's Day braclets, St. Patrick's Day jewelry, St. Patrick's Day Newport ri.